The phase splitter is a critical step in a push pull (differential) amplifier. Because tubes don’t come in “p-types”, we feed the output devices signals that are inverted relative to one-another in order get one to push while the other pulls. I’ve been finding solid state concertina-style phase splitters crop up here and there recently. A couple of days ago even the great Pete Millett got in on the action. Millett employs a JFET concertina splitter in his hybrid amp (a must-read, btw), but MOSFETs are also a good option for this application if you use parts with reasonable input capacitance. By using the MOSFET we’ve reduced the twin-triode count in a stereo push pull amp by one. The MOSFET will also let the splitter swing closer to the power rails, though in this particular case the 10BQ5 doesn’t really need a lot of voltage swing at its grid. The tubes shown are odd heater standards: 407A is 396A with a 20V heater and 10BQ5 is 6BQ5 with a 10V heater. You can find a lengthier explanation of the RC step network between the 407A and MOSFET in Morgan Jones or buried in this diyaudio thread. In brief, the resistor divider sets the DC voltage at the gate of the MOSFET while the 0.1u cap bypasses the upper portion of the divider at AC frequencies so that we don’t lose any gain due to the divider. Western Electric 300B back in production? You may find a brand new production pair of Western Electric DHTs under your Christmas tree this year according to a recent press release that updates the release schedule from the Georgia-based company. According to WE, new 300Bs will be shipping in December of this year. You can find detailed specifications on the product page here. Previous press releases reveal that modern manufacturing will achieve a better vacuum in the new production tubes and that cathode core material will be the same used in vintage tubes. Note that this is the core, not the emissive coating. Average lifetime is given as 40,000 hours (4.5 years of continuous playing). 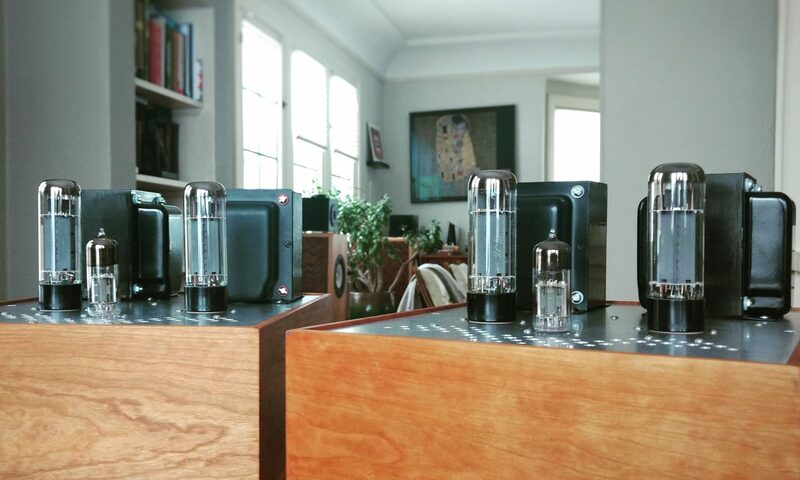 Though these new production tubes will not be cheap ($1299 per pair), new old stock WE 300Bs sell for eye-watering prices online. Provided these new production tubes demonstrate a good track record, the price for made in America tubes adhering to WE’s original quality standards may not seem so exorbitant to tube enthusiasts (who are a bit exorbitant by nature). The Western Electric brand name and trademark was revived by Western Electric Export Corporation. The current CEO is Charles Whitener, who was also a founder of Tube Depot (a Tennessee tube and parts retailer). Hoffman’s Iron Law impacts all systems, regardless of the type of amplifier. It states that speaker designers may only optimize for two of three performance goals: efficiency, size, and frequency extension. Modern speaker design goals trend towards slim and minimally-intrusive boxes. Because few are willing to give up low frequency ability, this aesthetic trend has resulted in lower-efficiency speakers, requiring ever more powerful amplifiers. When you have a set of bookshelf speakers or less-efficient towers, a single-ended triode amplifier may not cut it for power. Larger push pull (and parallel push pull) amplifiers are capable of using lower turns ratio output transformers and delivering more power to a load. That could be the difference between realistic dynamics and a more compressed musical presentation. Of course, there are some things to overcome when you upsize your tube amplifier. The power supply – If building an amplifier with (parallel) push pull power tubes, you’re going to need a lot of heater current. You’ll also need a lot of high voltage current. This means solid state rectification is the way to go. Using a bridge rectifier (four diodes) rather than a full-wave (two diodes) also saves some efficiency in the transformer. Size and weight – More current demands from the transformer(s) directly translates to a larger size and weight. Again, bridge rectifiers will help reduce the power transformer size slightly. A switching buck converter for heaters is also something worth looking into for efficiency’s sake. Building as monoblocks is a good solution, but you’ll probably spend twice as much on chassis, power supplies, etc. Current sharing – To keep standing DC currents from saturating the output transformer core, we want all our output tubes to share current equally (or at least balance per phase in each channel). Bias servos, Blumlein garter bias, individual fixed bias, and individual cathode resistors all have their advantages and disadvantages. Careful consideration here is key. Driving Miller capacitance – With a bunch of parallel output tubes, the input and driver stages will need some grunt to keep Miller Effect from rolling off high frequencies. This is especially true if you’re driving triodes in the output stage. A follower of some type may be needed to ensure a low enough source impedance. If you haven’t already gathered, I’m a bit preoccupied with how I’ll utilize the big old chassis I picked up recently. Clearly something large is in store. The present question is octals or DHTs and two or four output tubes per side. The chassis originally held some monstrous iron, so there’s space for just about anything. As if I didn’t have enough project irons in the fire, here’s a humongous old PSU chassis that is begging for an over-the-top power amp build. Eight octal sockets and very large transformer/choke footprints (mounting holes at 3.5″ and 4.75″ spacing).